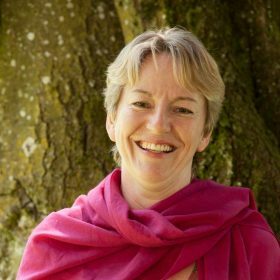 Gabriella Johanns acts as a Teacher for Movement and Dance (5Rhythms), a Healer and Facilitator in the fields of Spiritual Practices and Conscious Work. She is also the founder of the Center of Soulbeauty in 1992. Maneesh de Moor: Born in a musical family in the Netherlands, pianist/singer and producer Maneesh de Moor mastered the art of sound synthesis and studio engineering, after studying classical and jazz piano. He has collaborated with many musicians from around the globe and released the groundbreaking solo album “SADHANA, an ethno-ambient journey into Oneness” and the piano meditation music album “Signatures on Water”. After traveling Asia/India and touring extensively with Deva Premal and Miten, he set up home base and a recording studio in Bali. Mother India showed him meditation and depth, and mother Bali give him his voice. He now holds deep intent ceremonial chanting concerts, merging the spirit of ancient prayers with contemporary sounds and rhythms. Michael Stillwater is an artistic innovator, using music, words, and images. Founder of Song Without Borders, focused on personal and societal transformation through song and film. and artist/founder of Inner Harmony, he is a pioneer in the fields of American folk chant and intuitive song. His chants are recorded and sung by artists worldwide, and he facilitates creative expression seminars and retreats.. His documentary film series, In Search of The Great Song, addresses the underlying music inside everyone. The first feature-length release, Shining Night, called ‘a heartening rarity’ by Wall Street Journal, is recipient of four Best Documentary Awards. Nanina Ghelfi and Juri Viktor Stork: Powerchant is the debut album from collaborating artists Nanina Ghelfi and Juri Viktor Stork. Combining mantric singing (chanting) and colorful cultural sounds. Nanina Ghelfi has long established herself as an exceptional singer who masters the art of expressing emotion strength and spirit. The visionary Juri Viktor Stork, a multi- instrumentalist, vocalist and overtone- singer, responsible for arrangement and production, opens a gateway for the listener to merge with the spiritual realm, which is activated by the mantra. Brent Lewis: Brent’s life is his music, and the study of tribal rhythms. His education has been intense and in-depth studying drum masters in different parts of the world. His experience studying with the master professor Mr. Kwasi Badu of Ghana, Africa, was profound and very meaningful. Brent has traveled throughout Africa to study the roots of African music, tribal ceremonies and rhythms. His music takes ancestral rhythms from all over the world and combines them for a unique world beat. For over a decade Sudha has offered sacred chants, devotional mantras and songs from a variety of traditions, taking her audiences on an exquisite journey through sound, into the heart of stillness and prayer. She weaves influences from the from the East, from the Sufi, Tibetan and Indian traditions as well as chants from Africa, Hawaii, Native America and beyond, inviting listeners to join her in song, prayer and silence. One of Sudha’s main inspirations is the Indian mystic Osho, and it was as a part of the worldwide sannyas family that she started using music as a form of meditation. Since performs internationally through Europe, Australia, USA, Japan and India at concerts, festivals and meditation events. Recently during a deep process at the Oneness University near Chennai, India, Sudha experienced a profound sense of Oneness and found a path via which she could access the divine source of energy. This energy is now transmitted through her singing and is available to all who choose to join Sudha through listening to her live in concert or via her CD’s. Martin Knecht Music, melodies and beats are mostly done by technological devices these days. But what makes the sound really penetrate your skin, bones and mind, is the Human Element. This magical potion cannot be explained in words. It is that spirit, vibe or atmosphere that only once you hear it you know, a sonic bliss. For Martin Knecht, from Zurich, Switzerland, this journey of making sonic spells began in a very early age, as he was experimenting with his human senses to make music. He started using his voice in choirs as a young boy, learning tempo and rhythm, and then developed his other senses while playing the piano and guitar. Martin’s musical path diverges into three main directions: his main project as Human Element, his more downbeat and chill-out grooves under Mikrokosmos, and his other alias, DJ Martin, where he gets to play and juggle with Progressive Psy.